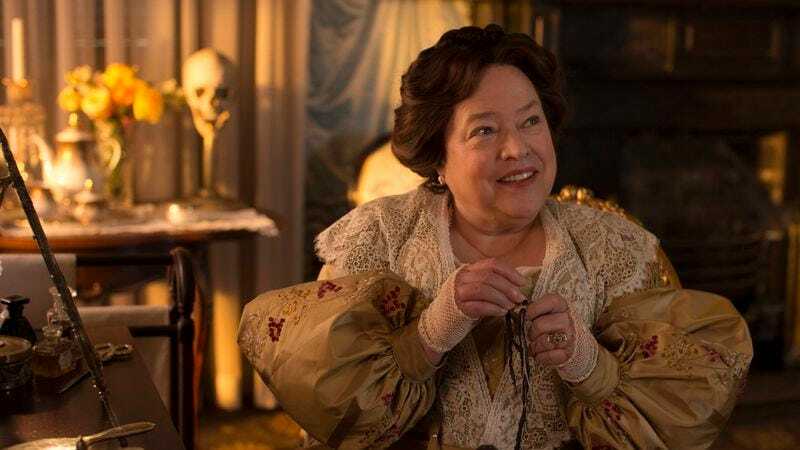 As reported by The Wrap, Kathy Bates has been hired to play the “foul-mouthed mother” of Billy Bob Thornton’s foul-mouthed Papa Noel in Bad Santa 2. As we reported earlier this month, Mean Girls’ Mark Waters will be directing the sequel, with Entourage creator Doug Ellin, If I Stay’s Shauna Cross, and a newcomer named Johnny Rosenthal each contributing to the script in some way. Maybe one of them wrote the basic plot, then another was in charge of adding in references to Bad Santa drinking a lot, and the third one came up with inappropriate things for Bad Santa to say. The character was named Bad Santa, right? Also, in a weird bit of information that is probably emblematic of the way Hollywood treats men and women differently, Billy Bob Thornton is only seven years younger than Kathy Bates. The ages of the characters will probably (hopefully) not be that close, but it’s still pretty weird that this casting is treating her as if she’s significantly older. On the other hand, watching Bates and Thornton say foul-mouthed things to each other will probably be fun, so whatever.